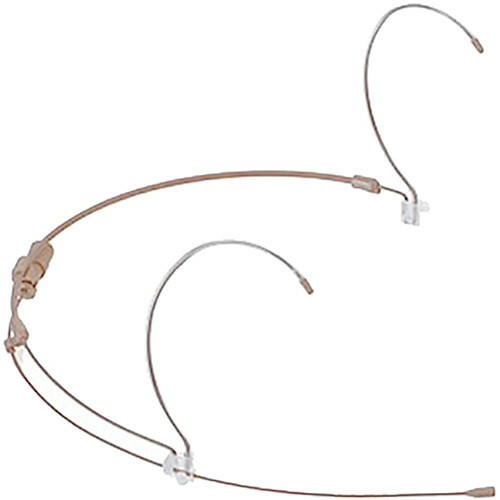 The tan H6 Omnidirectional Headset with Detachable Cable and 3.5mm Locking Connector for Sennheiser Wireless Transmitters from Countryman is a low-profile headset microphone that combines the transparent sounding E6 Earset with a comfortable, lightweight, and adjustable headframe. Weighing less than one-tenth ounce, it can be used as a water- and wind-resistant mic for capturing audio in houses of worship, theater, and outdoor vocal and speech applications. This omnidirectional H6 Headset's cable terminates to a 3.5mm locking connector for direct connection to a Sennheiser Evolution Series (G2 and G3), EW 100, EW 300, EW 500, or SK 1093 wireless bodypack transmitter. Box Dimensions (LxWxH) 9.8 x 7.8 x 3.3"
H6 Omnidirectional Headset with Detachable Cable and 3.5mm Locking Connector for Sennheiser Wireless Transmitters (W6 Band, Tan) is rated 3.0 out of 5 by 1. Rated 3 out of 5 by Scott from Not great for musical theatre These sound good if the performer isn't moving around too much. If there is any running or dancing, you'll definitely need to use the windscreens as these mics are very susceptible to wind noise. And you'll want to buy extra windscreens because they fall off very easily. The headset adjustments aren't the greatest either. These run pretty large.